"Nagano Snow Resort Pass" All-You-Can-Ride Pass - Travel Tips to Nozawa onsen Japan! 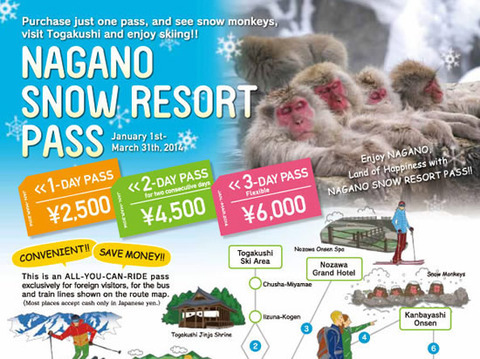 NAGANO SNOW RESORT PASS is a convenient and money-saving all-you-can-ride pass. With this pass, you can ride all buses and trains on the designated sections of designited lines as many times as you want. 3 types of NAGANO SNOW RESORT PASS.